For all his singularity, the Yankee maverick Charles Ives is among the most representative of American artists. Optimistic, idealistic, fiercely democratic, he unified the voice of the American people with the forms and traditions of European classical music. The result, in his most far-reaching work, is like nothing ever imagined before him: music at once unique and as familiar as a tune whistled in childhood, music that can conjure up the pandemonium of a small-town Fourth of July or the quiet of a New England church, music of visionary spirituality built from the humblest materials: an old gospel hymn, a patriotic tune, a sentimental parlor song. The way in which Ives pursued his goal of a democratic art, and his career of creating at the highest level of ambition while making a fortune in the life insurance business, perhaps could only have happened in the United States. And perhaps only there could such an isolated, paradoxical figure make himself into a major artist. Charles Ives was born in the small manufacturing town of Danbury, Connecticut, on October 20, 1874, two years before Brahms finished his First Symphony. During the Civil War his father George Ives had been the Union’s youngest bandmaster, his band called the best in the army. When the war ended George had returned to Danbury to take up the unusual trade, in that business-oriented town, of musician. As a cornet player, band director, theater orchestra leader, choir director, and teacher, George Ives became the most influential musician in the region. Yet while Danbury prided itself during the 1880s in being called “the most musical town in Connecticut” (that in large part due to George Ives’s labors), people still viewed the profession with little understanding or respect. That situation, which would have been the same in most American towns in the 19th century, had its impact on Charles Ives. Still, his family was prominent, noted for extravagant personalities and (except for George) a gift for business. After receiving his first instruction in piano and other instruments from his father, Charlie was turned over to more advanced keyboard teachers. For some years George hoped his son would find a career as a concert pianist. Instead, Charlie specialized in the organ, and by age fourteen he had become the youngest salaried church organist in Connecticut. Though he worked at music with remarkable discipline for his age, he also resented the demands of his training: “As a boy I was partially ashamed of it.When other boyswere out driving grocery carts, or doing chores, or playing ball, I felt all wrong to stay in and play piano.” Needing an antidote to the isolation and social anomaly of an intense education in music, Charlie threw himself into sports. One summer day at age fifteen, he played outfield for his baseball team in the afternoon and that night played a full organ recital. In short, Ives was something of a prodigy, and reached adulthood as one of the finest American organists of his generation. He began composing at around age thirteen, his first pieces little marches, fiddle tunes, songs for church, and the like: the kind of thing he heard and played around Danbury all the time. 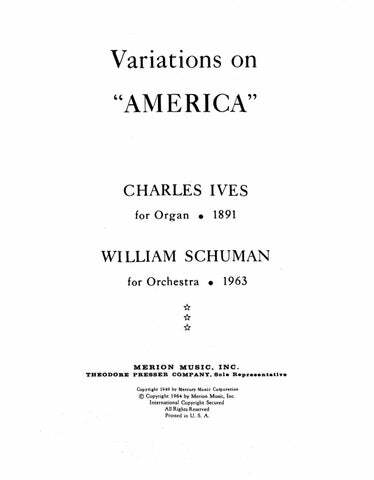 Early works include the precocious Variations on “America” for organ, written at seventeen; it would find considerable popularity after Ives died. The charming March No. 2 shows the teenager’s grasp of traditional popular genres and his lifelong propensity for weaving familiar tunes into his work: it quotes “A Song of a Gambolier.” The Circus Band, from the 1890s, rivals some of Sousa’s as a classic march of the era, enlivened with Ives’s characteristic rhythmic quirks. A great deal of Ives’s later and more innovative music also echoes his childhood. The Gong on the Hook and Ladder is a rhythmic study built from an image of the gala Firemen’s Parades of his youth; the ecstatic From the Steeples and the Mountains, for brass and bells, rings with memories of Danbury church bells. 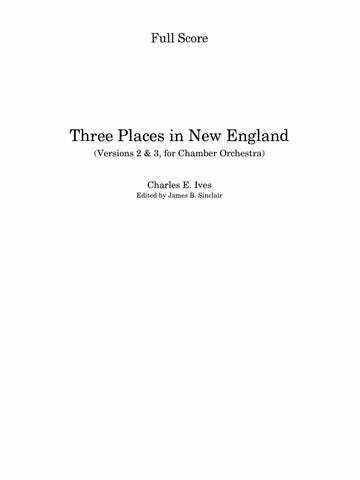 The story of Charles Ives’s mature music has to do with the intersection of a great inborn gift for music, a thriving musical atmosphere in Danbury: largely in vernacular forms, but including classical music from local players and visiting ensembles: and a father who raised his son with the same inquiring, iconoclastic approach to music as his own. George Ives would have his boys sing in one key while he accompanied in another; he built instruments to play quarter-tones; he played his cornet over a pond so Charlie could gauge the effect of space; he set two bands marching around a park blaring different tunes, to see what it sounded like when they approached and passed. Charles Ives grew up determined to find that wild, heroic ride, that music of the ages: the spiritual power he felt in the singing at outdoor camp meetings and in bands marching during holidays. It would take many years of struggle and experiment, however, before he fully possessed the musical language to transform that spirit into orchestral and chamber music. Yet the road to his maturity would be marked by a number of remarkable works, including three symphonies and dozens of songs, chamber and piano pieces. 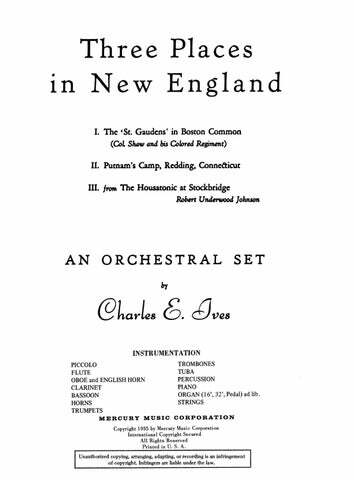 Many of Ives’s innovations developed directly from ideas of his father’s, though George was no composer but rather something like a Yankee tinker in music. It remained for the son to make artistic use of the father’s musical experiments. By his late teens, besides the practical music he was composing for use in church and for his father’s ensembles, Charles Ives had written studies in polychords and polytonality (including the bitonal “London Bridge is Fallen Down!” studies) and band variations on the hymn “Jerusalem, the Golden” that had contingents of his father’s band spread around the town square, sometimes playing theme and variations at the same time. 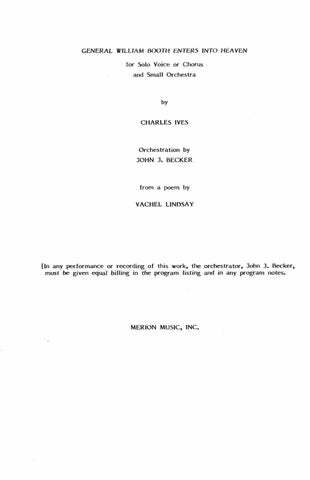 When Charles Ives left Danbury for New Haven in 1893 to prepare for Yale at the Hopkins Grammar School, he was already an expert composer of conventional short works, a few of which would be published in the next years. At the same time, with his own experiments taking his father’s ideas to new levels of sophistication, some of the musical consciousness that would create the mature work was already in place. What he required now was greater control of the orchestra and of musical structure: things his father could not teach him. Fortunately, after extra tutoring had allowed Charlie to squeak through the Yale entrance exam, he ended up studying with the chairman of the college’s new Music Department, who may well have been the finest composition teacher in the United States at the time. Soon after he began at Yale came the greatest blow of Charles Ives’s life: his father died suddenly of a stroke. 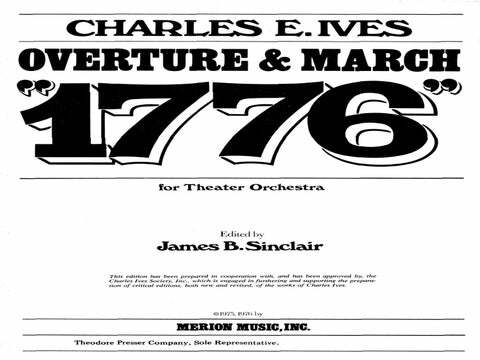 Charlie never got over it; he spoke of his father constantly to the end of his life, and seemed to feel that he was writing George Ives’s music. Despite lingering depression over his loss, Ives had a spectacularly successful career at Yale, in every way but academically. His average in musical courses was a respectable B, in everything else D+. Vivacious, funny, talented, indefatigable, “Dasher” Ives became one of the best-liked figures on campus. He spent his four years enjoying himself in various clubs, playing intramural sports, frequenting vaudeville theaters and sitting in for the pianists, playing ragtime and his own pieces at parties, and composing: light pieces for bands and glee clubs and church services, assigned works for his classes, and experiments. Smaller works from his college years include the scintillating March No. 6, with “Here’s to Good Old Yale” and his sentimental tune for the Glee Club, quite a hit at the time, The Bells of Yale. His large-scale works of the Yale years reveal a developing control of form, instrumentation, and thematic development, all of it reflecting Parker’s training. The First Symphony is essentially a brilliant and precocious homework assignment, a massive work in European style with echoes of Brahms, Tchaikovsky, and DvoÃ¡k. As he worked on the symphony, Ives also produced the First String Quartet, which he later subtitled, half jokingly, “From the Salvation Army.” It integrates gospel hymns, of the kind Ives grew up hearing in camp meetings, with the forms, textures, and thematic manipulation of European-Romantic music. Here Ives first suggests the direction of his maturity: a mediation between American and European elements, and between “high” and “low” art. 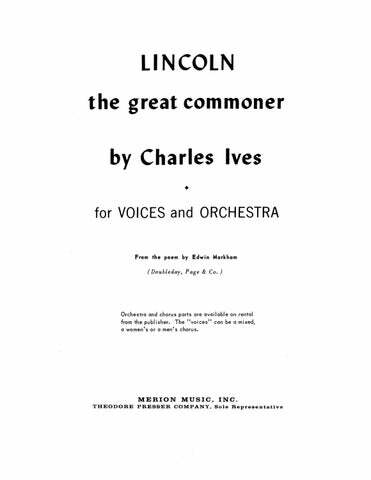 Ives also wrote a good deal of choral and organ music in connection with his organist job at Center Church. Most of these works, which Ives recalled as routine, were lost, but a few also showed his experimental side. More informally in his undergraduate years, in theaters and at parties Ives tried out rough superimpositions of tunes in different meters and keys. These included “stunts” such as Yale-Princeton Football Game that uproariously portray familiar events: something Ives would eventually do more seriously in works including Decoration Day. If he had continued on the career path of an organist/choirmaster/ composer/teacher like Horatio Parker, Ives would have gone from Yale to complete his studies in a European, probably German, conservatory. Instead, he took a path that led him into one of the most difficult and unconventional lifestyles of any major composer: acting on some of his father’s last words of advice, Ives decided to forego a musical career and go into business. When he left Yale in 1898, he headed for New York to begin as a $15-a-week clerk with the Mutual Life Insurance Company. During his first four years in the New York City of the “Gay Nineties,” Ives held organist/choirmaster posts in two prominent churches, played recitals, and composed the church cantata The Celestial Country, tuneful and respectably Victorian (though the cantata also includes organ interludes with exploratory harmonies). Though most of the more conventional works of this period are lost, from his church music Ives continued to develop new pieces, notably the four Violin Sonatas that together make up the most important American contribution to that genre. All the Sonatas are suffused with memories of Danbury church services and square-dance fiddle playing. 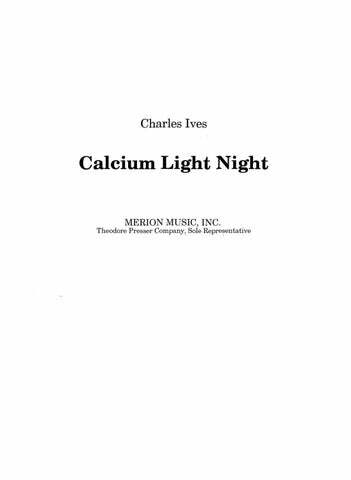 Another surviving choral work from that time, Processional: Let There Be Light, in which the divine radiance is expressed by pealing dissonances, shows that even in a church setting Ives could not entirely suppress his adventurous side. Ives’s more radical new works from the first decade of the century, none of them performed or performable at that time, reveal for all their fascination no overall direction. Ives’s dilemma was how to unify the separate streams of his music: the traditional European genres of symphony, string quartet, sonata, and the like, which his expressive ambitions drove him to take up; but also his love of American vernacular music, his passion for experiment, his interest in realistic and chance musical effects. His struggle toward maturity is shown in works written around the turn of the century such as the Second Symphony, which begins with a fugue of Brahmsian cast and includes snippets of Tchaikovsky, but also includes a great deal of American vernacular music, climaxing with the Stephen-Fosterish tunes of the last movement. A beautiful and compelling work, the Second was prophetic of the “Americana” style of Copland and others thirty years later. Weary of the creative constraints of being a church organist and choirmaster, in 1902 Ives “quit music,” as he put it; he resigned his organ job, the last formal connection with the musical profession he ever had. From that point his experimental side deepened, in the next years producing the transitional Third Symphony (subtitled “The Camp Meeting”), the wild, almost cubistic Four Ragtime Dances for theater orchestra, and two small but far-reaching works of 1906: Central Park in the Dark and The Unanswered Question, both of which use loose but carefully notated superimpositions of stylistically distinct material in different meters and keys. African-American vernacular music also contributed to Ives’s mature work: the Ragtime Dances demonstrate a fresh rhythmic style derived from the dancing syncopations of ragtime. The ultimate point of these experimental works, however, is not technical but expressive and programmatic. In the “cosmic landscape” of The Unanswered Question, a trumpet repeatedly poses “the eternal question of existence” against a haunting background of strings, finally to be answered by an eloquent silence. By that work of 1906, Ives was over half a century ahead of his time, writing in collage-like planes of contrasting styles. His epic First Piano Sonata, begun in 1901, was the first large-scale work in his radical vein, and cost him at least eight years of effort. It would not find its premiere until 1949. 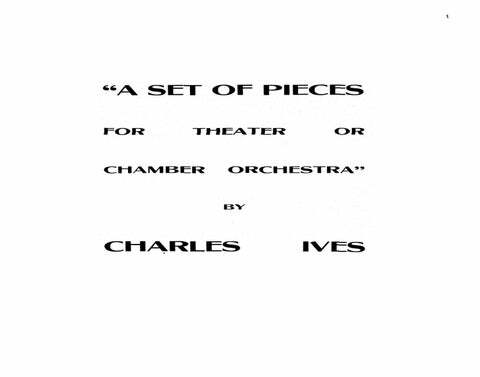 As a kind of laboratory, Ives consistently wrote studies for piano and chamber ensembles, each designed to examine a particular technical aspect. They include the elaborately polyrhythmic In Re Con Moto et al. and the two Tone Roads, all of which sound remarkably like avant-garde works of a half century later: but with an entirely Ivesian wit and rhythmic drive. From this decade also comes the wry, ragtimey chamber work Scherzo: Over the Pavements, suggested by the walking rhythms of people passing by Ives’s Manhattan apartment. At the same time as Ives was writing revolutionary pieces of mounting audacity and confidence, he continued to compose relatively conventional and quite beautiful songs, violin sonatas, and other smaller pieces. And his star rose precipitously in the insurance trade, which led to the formation of Ives & Co. in 1907, in conjunction with partner Julian Myrick. Its successor, Ives & Myrick, would become the largest agency in the country, noted not only for spectacular profits but also for Ives’s innovative ideas about selling and training. Two more things of great significance happened to Ives in 1906, one ominous and the other fruitful. After living since childhood at a near-manic pace: what allowed him to compose voluminously despite working full-time in an office: Ives had a physical breakdown, probably a heart attack and associated depression. Also that year he began to court a settlement-house nurse named Harmony Twichell, daughter of a well-known Hartford minister. Charlie had met her during his Yale years: she was the sister of a school friend: but their romance did not kindle until a decade later. After a long Victorian courtship, during which they found a transforming spiritual rapport, Charles and Harmony were married in June 1908. Between them they created a kind of theology around their relationship, seeing their love as a reflection of divine love, his music their means of spreading that love into the world. After years of prophetic experiments, Ives’s full maturity can be dated from his marriage to Harmony Twichell. Between 1908 and 1917 Ives composed at a pace hard to believe, given that his insurance agency was also burgeoning. From these years comes the completion of much of his greatest work: Three Places in New England; the symphony Holidays; the intense and mystical Second String Quartet; most of the monumental Fourth Symphony; the Second Orchestral Set; the Concord Sonata; the sprawling, raging Robert Browning Overture; many songs both progressive and traditional; and studies in various states of completion including the Tone Roads. In these works Ives found the “music of the ages” that he had been seeking since his youth: not only unifying vernacular and cultivated traditions and carrying his experiments to a prophetic level of imagination and sophistication, but finding a language to convey the spirit and fervor he had always felt behind the notes in amateur music-making. Filled with quotes of music from Beethoven to Stephen Foster and American hymnodists, Ives’s mature work is music about music, or rather music as a symbol of human life and striving and spirituality. For that purpose Ives used the music he grew up with, from the ceremonies and celebrations of Danbury’s daily life. His intentions go far beyond nostalgia, however. Memories of his childhood are transcended, his hometown made into an image of the primal human community, where people worship and celebrate, with music a vital part of it all. Two works from the second decade of the century can stand for the method and achievement of Ives’s maturity. His Decoration Day, the second of the Holidays, pictures an event Ives observed throughout his childhood on the holiday now called Memorial Day: his father’s band marched to the town cemetery playing a mournful tune; as the crowds stood among the decorated graves of the war dead, George Ives intoned “Taps” on his trumpet; then the band marched back to town to a lively tune designed to lift people’s spirits. From that narrative Ives shapes in Decoration Day an unprecedented musical stream of consciousness, in which revolutionary musical techniques are marshaled to paint a profound collective memory. When Stravinsky was asked his definition of a musical masterpiece, he answered with Decoration Day. The orchestral piece From Hanover Square North, at the End of a Tragic Day, the Voice of the People Again Arose, which concludes the three-movement Second Orchestral Set, came directly from a personal experience. On the way home from work Ives saw a crowd of people on a Manhattan train platform break into a hymn, in response to news of the sinking of the Lusitania by a torpedo. The work transforms that moment into a complex musical fabric, in which threads of the hymn gradually coalesce to the climactic proclamation of “In the Sweet By and By.” The hymn sounds as rough and untutored as the voices of men and women on the street, but it is filled with overwhelming emotion: the music of the ages. Thus Ives’s comment, echoing his father’s words: “What has sound got to do with music! ?” For Ives, music is not mere sound but the underlying spirit, human and divine, which the sounds express even in the inexpert playing and singing of amateurs. Thus the paradox of Ives’s music, echoing his paradoxical person: he could be realistic, comic, transcendent, simple, complex, American, and European, all at the same time. If some of his music seems crowded nearly to bursting, it is a vibrant and entirely realistic portrayal of his conception of life, his sense of democracy in action, and of his own all-embracing consciousness. As Ives once said, Music is life. By 1917 Ives had acquired an adopted child and a new obsession: working to support the American war effort (despite his earlier outspoken objection to the war). With the strains of parenthood and campaigning for war bonds added to the already exhausting demands of his business and creative life, and with the drain of steady rejection from musicians, Ives’s health collapsed. In October 1918 he had a serious heart attack just before his 44th birthday. Neither he nor his work ever completely recovered. Ignoring lingering weakness from his heart attack, in the first half of the 1920s Ives kept to his usual frenetic pace, now spending a great deal of time promoting his work, cultivating friendships with musicians, joining and supporting organizations that promoted progressive music. By this time, the Modernist movement was gathering steam in the U.S., much of the musical part of it spiraling around the energetic young composer Henry Cowell, who took up Ives’s cause and remained one of his champions. Starting with songs and the Violin Sonatas, Ives’s music began to be played in the 20s, largely in “Ultra-Modernist” forums. But Ives’s infirmities steadily eroded his energy, creative and otherwise. Finally one day around 1927 Ives came downstairs in tears and told his wife, “I can’t seem to compose any more. I try and try and nothing comes out right.” Three years later he resigned from the insurance agency he had built. For the rest of his life Ives was an invalid. Yet through decades of physical misery Ives remained the same optimistic, funny, gloriously eccentric, vibrant spirit he had always been. When he was able, he saw to the practical side of being a composer: writing letters to those interested in his work, editing pieces for publication and overseeing editing by others, and supervising the copying of his pieces. The wealth he had earned in business not only supported his own work, but flowed steadily into the cause of progressive music all over the U.S. Periodically during his last decades, Ives would take up and add a few notes to a titanic, transcendent work he had conceived in 1915, at the same time as the end of the Fourth Symphony: the Universe Symphony, which he described as aspiring “to paint the creation, the mysterious beginnings of all things…the evolution of all life in nature, of humanity from the great roots of life to the spiritual eternities, from the great inknown to the great unknown.” The symphony was a gigantic credo, and a conception unfinished and unfinishable in the world. Yet over the decades Ives returned again and again to the idea, finally conceiving it as to be presented outdoors, with orchestras in valleys and choruses on hilltops. Only 39 pages of sketches remain of the Universe; more may have been lost. Several people have made realizations and creative extensions of the material, following up on Ives’s suggestion that others take up the piece. The existing sketches reveal a fascinating fragment whose elusive whisperings and giant rhythmic cycles resemble the mystical finale of the Fourth Symphony. The rise of Ives’s reputation was slow, but important musicians admired him and some: Henry Cowell, Nicolas Slonimsky, and Lou Harrison among them: devoted significant parts of their lives to his work. Aaron Copland, Harrison, and pianist John Kirkpatrick gave important performances of his music in the 30s and 40s, earning Ives glowing reviews and a Pulitzer Prize (1947). Copyright ﾩ 1998 by Peermusic, Ltd.
(Arranged and edited by Henry Cowell in collaboration with the composer) 2:30 Picc. Ob. Cl. Bsn. Tpt. Tbn. 2Perc. 2Pno. 4:00 Mixed Chorus; 4Tpt. 3Tbn. Tuba. Cb. Org. 7:00 Ob. (or Fl. ad lib.) Cl. E.H. Bsn. (or Eb Bar.Sax.) Hn. Timp. Pno. Bells, Str. 8:00 Unison Chorus (ad lib. ): 2 2 2 2 – 2 3 3 1; Marim. Pno. Cel. (ad lib.) Hp. Str. 4:00 1(dbl. Picc.) 0 1 0 Alt.Sax. – 0 0(Cornet) 2 0; Pno. 2Perc. Str. 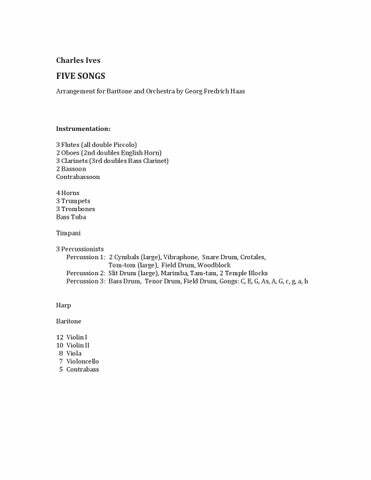 for Voice and Orchestra 11:00 Solo Voice; 2 2 2 2 – 1 1 0 0; Perc. Pno. Hp. Str. 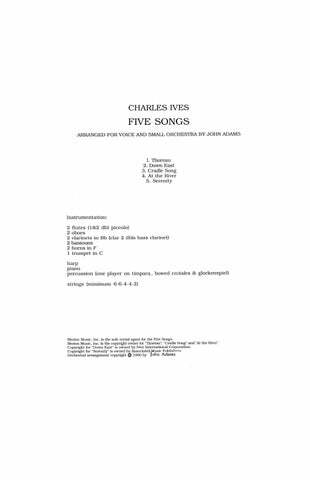 for Solo Baritone or Unison Chorus and Orchestra 5:00 1 1 1 1 – 1 1 1 1; Perc. Pno. Str. 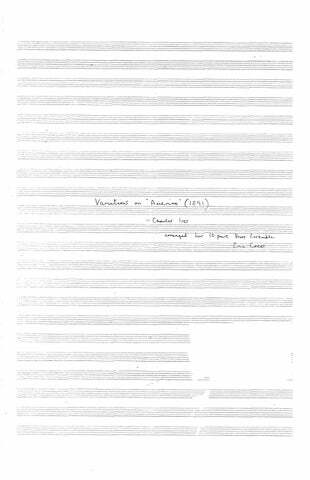 for Voices and Orchestra 4:00 1 1 2 1 – 0 1 1 1; Timp. Pno. Str. for Chamber Orchestra 3:00 2Fl.(Picc.) Ob. Cl. 2Cornet. Tbn. 2Perc. Pno. (Complete) 9:00 **The See’r – 1’30”** Cl. Hn./Tbn./T.Sax./Bar. Hn. Cornet in C, Drums, Pno. A Lecture – 1’30” – Fl. Cl. 2Bsn. Sn.Dr. 2Vln. Vla. Vcl. †The New River – 1’† – Fl. 2Cl. B.Sax. 2Tpt. Tbn. Timp. Perc. 4Vln. Cb. Pno. Ob. Tpt. (C) Indian Drum. 2Vln. Vla. Vcl. Cb. Pno. Fl. Tpt. (C) Tbn. Glock. Pno. 2Fl. Tpt. (c) 2Vln. Vla. Vcl. Cb. E.H. Hp.(opt.) Pno. Cel. (or Glock.) 3Vln. Fl. E.H. Perc. Pno. 3Vln. Vla. Vcl. Cb. 1 1 E.H. 1(A) 1 – 3 1 1 1; Perc. Cel. Str. (1935 Edition) 18:00 2 2 1 1 – 2 2 2 1; Timp. Perc. Pno. Org. (ad lib.) Str. 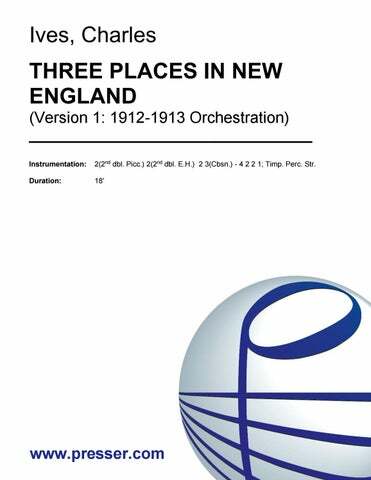 (Version 1: 1912-1913 Orchestration, edited by James Sinclair) 18:00 2(2nd dbl. Picc.) 2(2nd dbl. E.H.) 2 3(Cbsn.) – 4 2 2 1; Timp. Perc. Str. 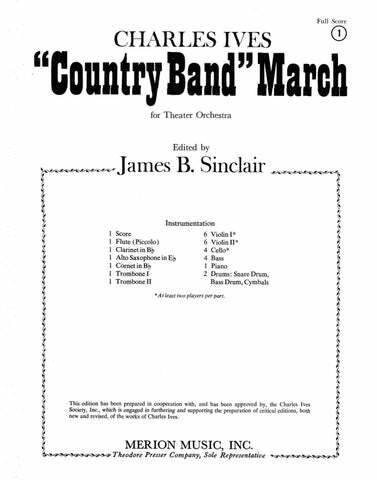 (Version 2-3: 1929 Version for Small Orchestra, edited by James Sinclair) 18:00 2(Picc.) 1 1 1 – 1 1 1 0; Timp. 2Perc. Pno. Str. (Version 4: Original Orchestration, restored and edited by James Sinclair) for Orchestra 18:00 3 3 2 3 – 4 2 3 1; Timp. Perc. Pno.(Cel.) Org. 2Hp. Str. (Orchestra Version by William Schuman) 8:00 3 2 2 2 – 4 3 3 1; Timp. 3Perc. Str.